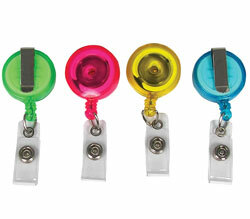 Swiveling ID card reel allows for convenient scanning of ID badges and cards. Swivel clip design rotates 360° for easier attaching to belts, backpacks or bags. Snap-on ID strap attachment connects to any card or badge holder. Features automatic retractable 30-inch cord. Black reel with clear strap attachment.